Rick may have recently gotten a haircut, but is he on the path to go for a full buzz like his old buddy Shane? It seems pretty clear that living back in civilization is proving to be much more of a task for some of the main survivors on The Walking Dead. And not all of them are keeping it together and “playing house” in Alexandria as well as someone like Carol. But who thought Rick would go ballistic on The Walking Dead Season 5 Episode 15? Sasha would have been the obvious choice, and she took her crazy antics up to a dangerous level when she started hunting walkers outside the walls. And I get that for her, and many of the others, living behind the walls and making casseroles just feels wrong with the mess that’s going on outside. It even feels weird watching characters walk a dog or chat and laugh on porch steps, just knowing and witnessing what the survivors have been through. So I can imagine how tough it must be for some of them. But I couldn’t help but feel frustrated at Sasha’s adamant attack on a mass group of walkers. I was glad that Michonne and Rosita (who I almost didn’t recognize at first), tried to find her and help, but I kept waiting for Sasha’s actions to get one of them bit. Ugh, Sasha. However, Rick truly took the award for going crazy during the hour after Pete helped flip that switch for him. Rick may have been moving in on a married women, trying to pull a Brady Bunch for the two families, but he went all out in dramatic and bloody fashion. I still feel like he and Jessie needed more of a buildup in their relationship before he would jump in to make his grand gesture, but Pete’s an abusive and dangerous man who needed to be dealt with. But wow was Rick lucky Michonne stepped in to knock him out and potentially keep the entire group from getting exiled. That whole situation had me waiting for someone to wind up dead from Sasha, Nicholas (surprise! 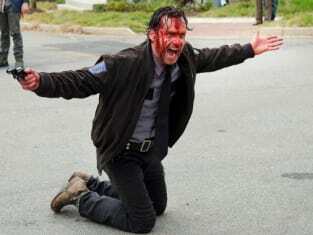 he took Rick’s hidden gun) or someone else. Things have definitely escalated quickly after the events of The Walking Dead Season 5 Episode 14, and while some of the fallout from that hour was briefly touched upon, I was surprised there wasn’t more focus on say Eugene or Father Gabriel or Glenn or even Noah’s death. There’s definitely a lot going on and a lot more stuff happening on top of that that hasn’t left tons of room for the characters to just sit around and chat. And when Rick goes crazy and starts waving around a gun, that's probably going to take priority. 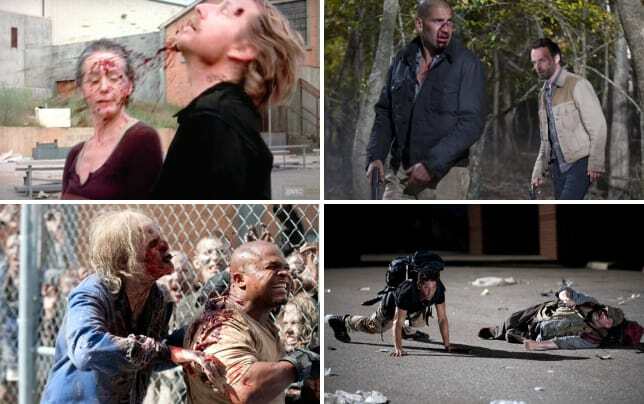 I do wonder if whoever is chopping up bodies and carving letters into walkers is going to force the people inside Alexandria to cut their personal squabbles and team up to face a more frightening enemy. 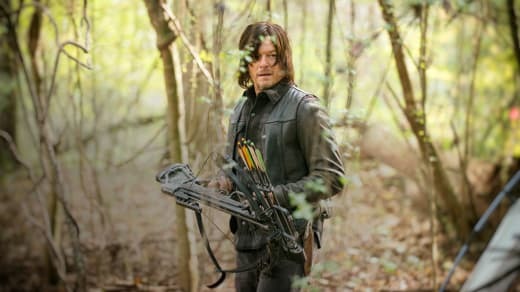 Because as much as the stuff with Rick was intense, or I enjoyed getting more Glenn moments (I’m worried for his character in the finale), I was really invested in Daryl and Aaron tracking down that campfire in the distance. Their team-up has been great to watch, and getting some mystery and the potential for another new direction in the series was exciting. It looks like the series is charging straight into the 90-minute season finale, and it's exciting to say that I'm geared up to see how everything goes down. And fingers crossed our favorite characters don't die! Will Rick be exiled? Is Alexandria in trouble? Who will die? Sound off below, and get ready for the finale by making sure you’re all caught up on the episodes. You can watch The Walking Dead online right here at TV Fanatic! NOTE: The Walking Dead Season 5 Episode 16, "Conquer," airs on Sunday, March 29. 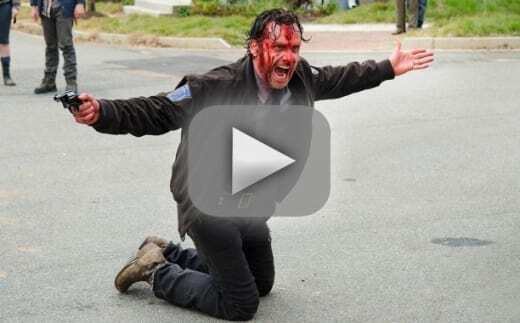 The Walking Dead Review: What Did Rick Do?! ?